From the first scene in his debut film, audiences knew that they were seeing a very special actor that would go far and have a long career. 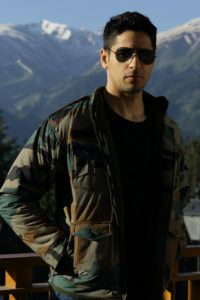 That movie was Student of the Year and the actor – Sidharth Malhotra. 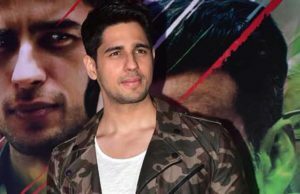 The young actor continued proving his promise and brilliant acting ability in films like Ek Villain, Hasee Toh Phasee, Kapoor and Sons and Ittefaq. 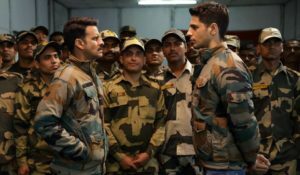 For his newest film role, Malhotra is playing a military officer in the espionage thriller Aiyaary. Directed by Neeraj Pandey, the film also stars Manoj Bajpayee, Rakul Preet Singh, Pooja Chopra, Adil Hussain, Kumud Mishra, Naseeruddin Shah and Anupam Kher. 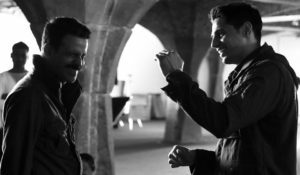 Aiyaary, which means ultimate trickery, tells the story of two Indian army officers. A mentor and his protégé. The mentor, Colonel Abhay Singh, intelligence par excellence has complete faith in the system of the country. While protégé Major Jai Bakshi thinks otherwise because of what he has seen and heard in his recent stint in surveillance unit. Jai goes rogue and what happens next, well we will find out when we get enthralled by the action drama releasing on February 16th! In a much too short but wonderful conversation, Sidharth talked with Stacey about all things Aiyaary and the art of his craft. What went into your decision to play this role? First of all, I am always, always, hungry. Hungry to do new things, new characters and to enter into new different worlds in every film that I do. With this one, it was the same thought. I have never played an army officer. I have never worked in a Neeraj Pandey film. Also, just the world of it… it is something I have never entered into. It is a spy thriller; it talks about military intelligence within the country and certain controversial things within the country, whether it is issues on Kashmir or issues on corruption. I found the world very, very relevant and interesting. The story, which is very relevant I think is one that is interesting to be told, especially from my character’s point of view. I am playing a young major who represents pretty much the point of view of the youth of India. So I think a lot of all these factors I was pretty excited to yes to Aiyaary. How do you, as an actor, find your character, and especially a military officer like in this film, who you haven’t been – this is someone completely new for you, so how do you become him? For me, what works is to find similarities, for sure, instead of starting from him being a stranger. If you can find similarities between that character and you that is what the basis is for me. In this, I just found this character very, very focused, very driven, very earnest. He wants to step up and take actions against things he doesn’t or does believe need to be changed and things he wants to do. So I stem from there and then you add the whole layer of being a military intelligence officer – a spy, an army officer. Then there is the body language and the discipline. I met a couple of military personnel to do research and I hung out with them. There was a lot of work that went into reading up as to what our intelligence agencies in the country do, whether it is getting information, whether it is doing secret missions. You know, this is something I am really keen and interested in anyway being a regular spy genre fan. I was very excited to get into the whole world. We actually shot all of it on location. It is a first for me. I have done films in the past, which have always had a set for the film and also the songs. This time Neeraj Pandey, for authenticity, liked to shoot in locations. I think it really creates a different world. It adds a lot to the flavor of the film, which really worked for us. It makes it more real and authentic. I think it is a huge positive. Then since it was shot on location I imagine that dubbing played a big part in the film. What is it like to recreate the scenes in the studio? Oh yes, that is a trend and a phenomenon which is still very popular in this part of the world. I am not sure how much Hollywood does this, but we as a culture are pretty used to dubbing our own films. I, in my third film, Ek Villain, I dubbed the whole film and even Aiyaary was no different. I personally feel with just dubbing you can really up parts of your dialog and performance, which you probably don’t think about, or do, but can’t when you are shooting live. I mean there are so many things running in your head when you are doing live shoots, live sound. You know, there are certain locations that you don’t want to be that loud in; you don’t want to be that silent in and in the dub you can pretty much take any tone you want. What is it like to see yourself on screen during the dub? Do you like to see that? Um…yes… I am a bit critical. I start criticizing so I am not a big fan of watching my own stuff again and again. I would want to look at it from an academic point of view, but mostly I just see things I could do better. It is not a great feeling for me. But yes, it is not a bad thing to finally see your film on the big screen because you are making it for that format. You kind of get an understanding of what you need in a scene and if you need to improve anything or if you want to change anything. What was it like to work with Mr. Neeraj Pandey? I would say he is a hard taskmaster. He likes a certain discipline on set because there is a lot we have to finish in one day – he shoots really fast. I feel he is one of the most clear directors I have worked with. His clarity in what he wants is absolutely crystal clear. Just seeing a man writing the script, writing dialogs, writing the screenplay gives him an immense amount of confidence and, again I would say clarity on set, because he has pretty much done all of the departments of creating that script. It gives the actors more confidence because he has also written the dialogs so he knows why that particular character is saying that and why at this particular point in the film this scene needs to come in and what is the story behind that and what it is all about. It actually made it very clear for me and much easier for me so I was pretty happy and excited to be on set and interacting with him about the scenes and the film. You are also working with the incredible Manoj Bajpayee, what was it like to do a scene with him? As you know, dominantly, the main film revolves around me and Manoj Bajpayee’s character, tussling, having friction against each other. It is a cat and mouse chase. I would say the experience has been really enriching being on set with an actor like him and doing scenes with him, observing him. Then our conversations about acting and performances. I used to just spend time preparing, rehearsing with him. Manoj Bajpayee always has some tricks up his sleeve before he faces the camera so that was very interesting to watch. I learned a lot of things, which I am going to carry forward to my next film. Looking back over you career so far how do you think you have grown as an actor? I feel it is just the beginning and that I am not anywhere near the middle. I would say a lot has to be done. A lot has to be achieved. A lot has to be learned. You know it is a never-ending process – learning and growing as an actor. But I think predominantly what has changed is maybe having a better instinct. A better instinct as to whether it is picking scripts or picking the director because eventually I realized that is all an actor has. There is no reason that somebody can give you as to why you want to work on that script or why you want to work with the director. It is just an instinct that comes in and it is some kind of creative motivation. I think I just want to polish that and listen to that so that becomes much clearer. What film is coming up next? It is a biopic about an army officer. It is based on the 1999 India-Pakistan Kargil war. It is about a soldier who gave his life there. It is a full ode to his life and to his sacrifice. I would like to thank Sidharth because he is always so genuinely warm when you talk with him about his films. In this interview, as well, he was so nice and gave such amazing and well thought out answers. You can tell he is very dedicated to his craft and his performance. I hope and look forward to chat with him again. He has only been in the industry for 6 years and we have a feeling Sidharth will have a long career and audiences will see many more acclaimed and fabulous performances from this actor. We can’t wait! Be sure to check out his performance in Aiyaary in theaters on February 16th.